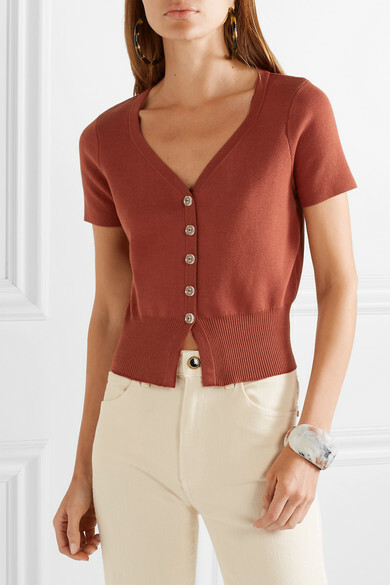 SIMON MILLER's short-sleeve 'Senoia' cardigan looks equally chic styled with jeans or the coordinating 'Luz' skirt. 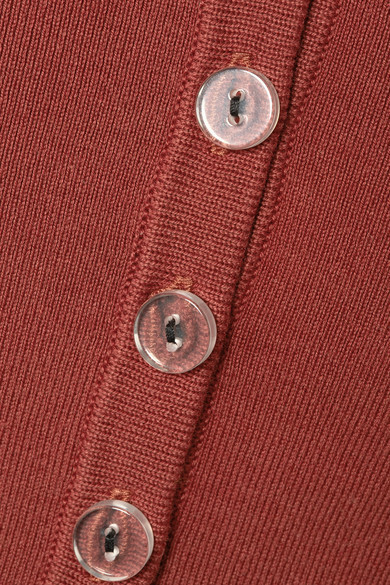 Made from soft cotton-blend, it's designed for a close fit and has a wide ribbed hem that hits at the narrowest part of your waist. Complement the pretty 'Rust' hue with light neutrals. Shown here with: Khaite Jeans, SIMON MILLER Pouch, BY FAR Mules, Cult Gaia Earrings, Dinosaur Designs Bracelet, Jennifer Fisher Ring.